With 7.1 million workers engaged in ‘precarious’ employment and 77 per cent of the self-employed living in poverty, a new report ‘Working Together: Trade Union and Co-operative Innovations for Precarious Work’ calls for increased protection for those operating in the so-called gig economy. The report, which has been supported by the Solidarity Economy Association alongside the Network for Social Change is the follow-up to a landmark report on freelancer co-operatives in 2016. The report Not Alone mapped the emergence of self help and mutual aid across self-employed workers in a wide range of countries, from Belgium to India. In turn, this helped to inspire new co-operatives here, with a key milestone reached with an investment by the trade union Community in the co-operative social enterprise, IndyCube. 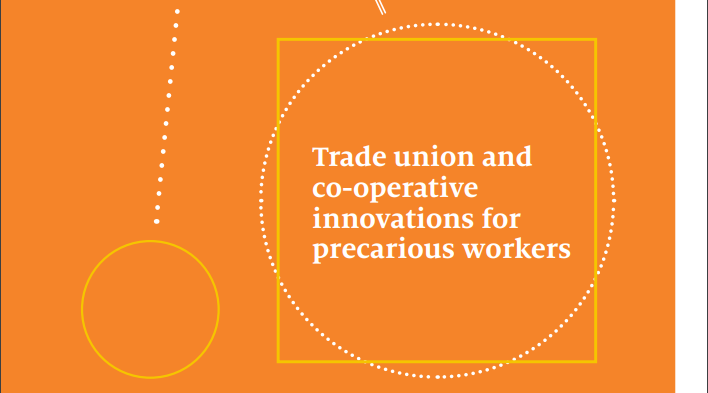 Drawing on new research and including a close partnership with trade unions in the UK and liaison with practitioners abroad through the co-operative network CICOPA, Working Together identifies the eight most positive innovations in terms of technology, co-operation and self-organisation by workers in the UK. Pat Conaty, co-author of the report and SEA supporter member and director, explains below. Working Together was authored by Pat Conaty, Cilla Ross and Alex Bird. It was commissioned by Co-operatives UK and The Co-operative College, and supported by the Network for Social Change, Wales Co-operative Centre and the Solidarity Economy Association.